I have several composts. The auto-sweeper supplies the composts with polluted dirt, but they will not sweep the resulting dirt to the conveyor loader. A reload of the save causes this to start working again. Unknown. Sorry :( I will post again if I figure something out. This exact problem is a bane of my base. At random times my base will have food shortages because my slime doesn't reach my mushrooms, simply because one auto sweeper arm bugs out and stops working. The only fix I know of is either to reload the save, or to interrupt power to the arm. I'm having the same problem. Autosweepers stop working, the way to make them work for me is to reload save or rebuild receptage. I think you can reproduce this with constructing/deconstructing conveyor rails around the map. Also confirmed. A save / reload fixes for me, but that is a real pain. Going to +1 this as well. I'm having this problem with Water Sieves and Composts. At certain points the sweepers just decide to not work anymore. 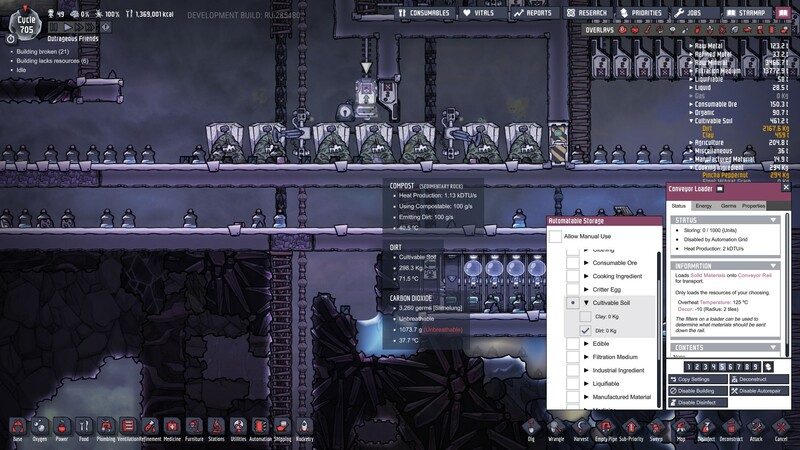 The Water Sieves are entirely isolated, so it can't be dupes trying to interact with them, I only ever figure out they stopped working when I get the "Not enough oxygen generated" alert. And yes, a save reload fixes this.